I was poking around with Google Earth’s new space exploration features and had a bit of a surprise. It turns out I live just a little west (west?) of the constellation Auriga. Little did I know! I had an overlay of geo-bookmarks on when I was in the Earth view, and after I switched to the space view, I saw some little pushpins amidst the stars. As I zoomed in, their labels resolved and I wondered if I had entered the Total Perspective Vortex. It must not be quite that potent, because I seem to have survived. Click on the screenshot to get a bigger view. 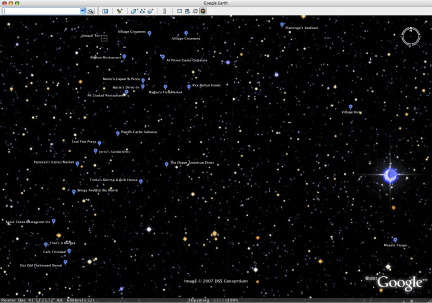 Note that earth-based queries don’t work in the space view, so if you want to find your galactic neighborhood, you need to find it in Earth view. 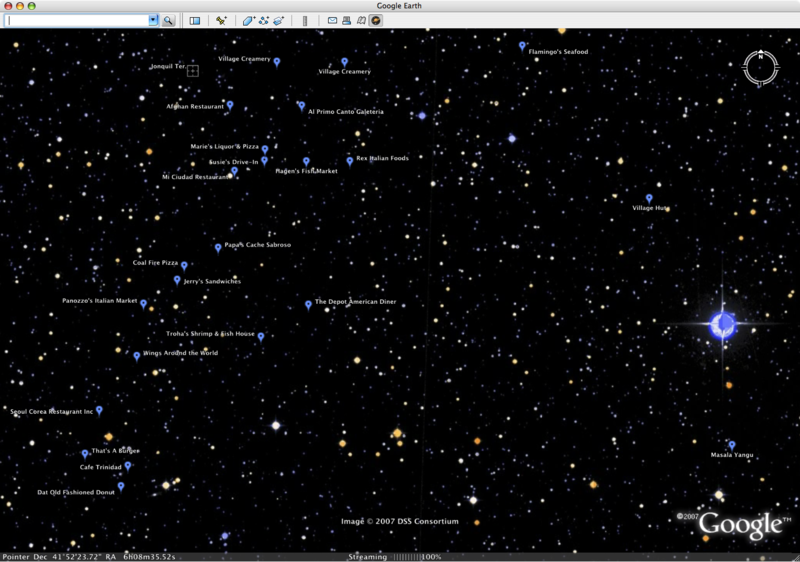 Then after switching to Space view, you can click on the place in your “places” sidebar. This entry was posted in geo by Joe. Bookmark the permalink.